With Halloween fast approaching, children across the country are already chomping at the bit, thinking about the piles of candy coming their way. Parents, however, should be careful about the amounts and types of candy that their children eat. Beyond simply preventing wild, candy-fueled misadventures and tantrums, it’s important to limit your child’s intake of certain candies in order to promote healthy oral hygiene. In this post, we’d like to look at five of the worst Halloween treats for your child’s dental health. Any candy that is excessively chewy or sticky is bad for two reasons: first, it is loaded with sugar and second, it can get lodged in your child’s teeth and cause serious tooth decay. Nuts often break down into small fragments that can easily get trapped in between the teeth, causing cavities. Additionally, they can crack already compromised teeth and dislodge fillings. Sour candy is extremely acidic and can erode your child’s tooth enamel. Worse yet, brushing immediately after eating sour candies can exacerbate the issue, distributing the harmful citric acid across teeth rather than removing it. These types of candy are almost pure sugar. With their fine texture, they easily get stuck in between teeth, caught in hard to reach areas where they can cause cavities and tooth decay. 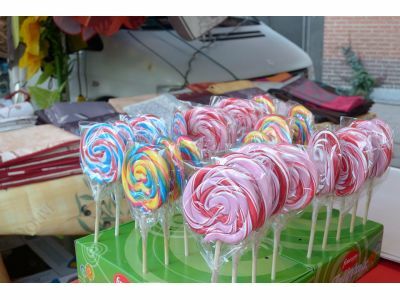 Lollipops and hard candies are typically savored for long periods of time. This causes sugar to collect and linger on teeth longer than necessary. In addition, biting down on hard candies can break or chip your child’s teeth. At Halonen Family Dentistry, we’ve been a favorite Battle Creek dentist since 1979. With a comprehensive list of services, from dental implants and Invisalign braces to cosmetic dentistry and preventative care, we’re positioned to be your family’s dentist for years to come. If you’ve been looking for a great, inviting dental office that will take your family’s oral hygiene seriously, contact us today to learn more about Halonen Family Dentistry.